Partnering with SchoolInfoApp is the next step in TeacherLists’ overall mission of making the back-to-school process as simple as possible. 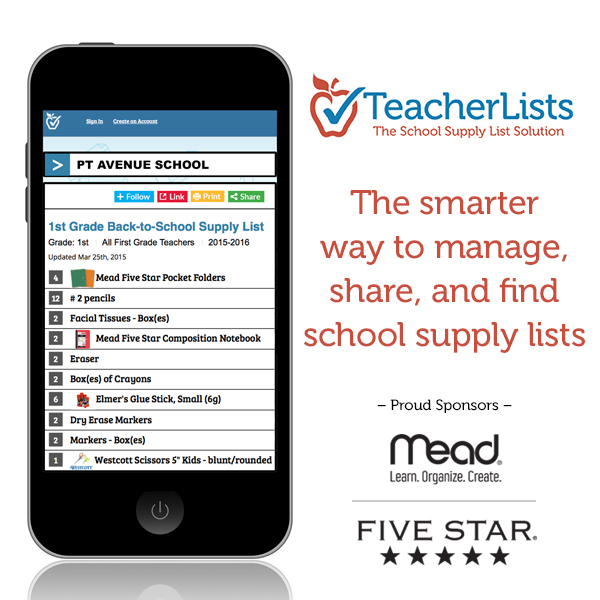 TeacherLists, the smarter way to manage, share and find school supply lists, announces a partnership with SchoolInfoApp to digitally streamline the age-old school supply lists and ease the stress teachers and parents often experience during the back-to-school season. SchoolInfoApp builds great apps for great organizations and has worked with 600+ schools, districts and other organizations throughout the US, UK and Canada to develop and manage highly rated branded mobile apps with features that students, parents and teachers find time-saving, simple and useful. For more information about SchoolInfoApp, visit http://www.schoolinfoapp.com.